Imagine yourself as the next owner and steward to the famous circa 1763 Arch House in the historic village of Waterford Virginia. This rare opportunity comes along once in a lifetime. Enter the circa 1763 home at the ground level and immerse yourself in the early history of our country as you take in the heart-pine wood paneled walls, original brick fireplace and one of the town of Waterford's original hand dug wells. Previous owners have taken care to maintain the Arch House's place in history through careful renovations that provide modern amenities while preserving the architecture and elements that make the Arch House unique. 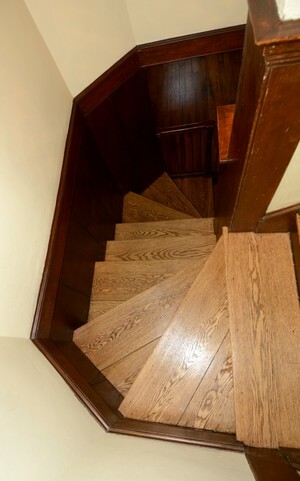 The home features three bedroom's, one and one-half baths on four living levels, curved wooden staircases leading to large rooms with wood paneled walls, three fireplaces and wonderful random width wide-plank white oak hardwood floors throughout. The archway for which the home is named is uniquely attached to and part of the dwelling, making it historically significant. It is one of two such stone archways known to still exist in the State of Virginia. 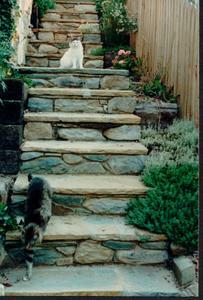 Stone steps lead you through the arch and up into the terraced "secret" garden where natural stone walls frame garden beds overflowing with perennial flowers. Two stone terrace landings provide a lovely private area for outdoor dining or for sitting and reading a good book while surrounded by natural beauty. About halfway up the stone steps is an old brick summer kitchen which now provides a lovely space to set up a bistro table for afternoon tea or to enjoy your morning coffee. More steps lead to the upper terrace and then to a large conservancy area which will be left undisturbed. This wonderful and inviting home provides tranquil and inspirational surroundings. 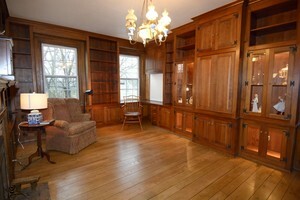 Let your imagination wander as you walk through the home and experience its place in history. The Arch House represents one of the earliest structures of importance in Waterford. 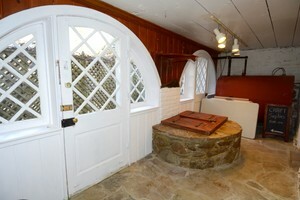 The property includes one of the two hand dug wells the served the village. It is believed to be constructed as early as 1735. The well is now enclosed in "the Well Room" but it was originally in an outdoor courtyard adjacent to the house and was used by the fire brigade to put out fires. The Arch House well was considered the most reliable well in town. It has never run dry. Volunteer firemen would hang their leather buckets in the archway and gathered water from the well. Although it is no longer used, the well remains part of the house. Like most homes on Main Street, the Living Room was used for many different types of business establishments over the years. It served as an Ordinary for the original Loudoun Hotel & Inn and Talbots Tavern next door. It was also used as a watchmaker's shop, woodworking shop, brass shop, a school, an art studio and even as a auto body shop in the early part of the 20th century. Former neighbor an owner of the Iron House, John Rollison, recalls that Model T's were hoisted up into a maple tree in front of the home to be serviced. Just imagine. 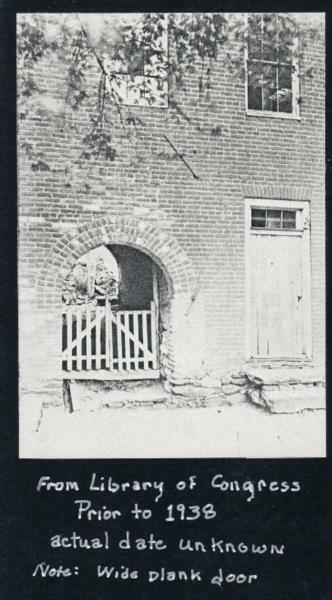 The Arch House also stored ammunition for the Loudoun Rangers (commanded by Samuel C. Means, a Quaker and owner of a mill in Waterford) during the Civil War fight of 1862 at the Baptist Church in Waterford. Click for more history of Waterford during the Civil War. 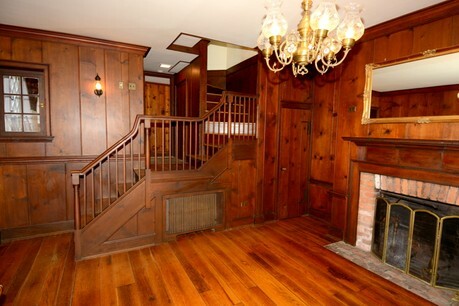 This is a one of a kind property and a unique opportunity to own a piece of history! The exterior, as all homes on Main Street in Waterford, have a historical easement to the Virginia Department of Historic Resources which was done in the 1970's to preserve it's historical appearance, the interior of the properties are not eased. 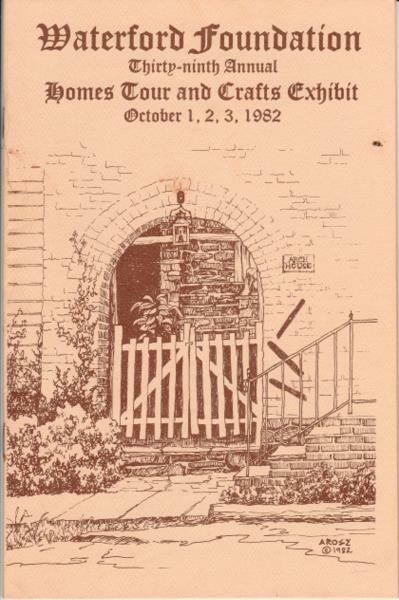 Information can also be obtained from the Loudoun Historic District Review Committee and from the Loudoun Historic District Guidelines. Waterford was founded about 1733 by Amos Janney, a Pennsylvania Quaker. Soon after it became a very popular area for Quakers to settle and establish businesses. Mills were built along Catoctin Creek. The village continued to grow until it was the second largest town in Loudoun County before the Civil War. This unique and thriving Quaker settlement is situated on Catoctin Creek in the northern part of Loudoun County, 6 miles south of Taylorstown, 7 miles northwest of Leesburg, 47 miles west from Washington and 159 miles north of Richmond. It was named after the town of Waterford in Ireland where some of its founders had formerly resided. The first house within the town limits was built by one Asa Moore and remains standing today. In common with the other towns and villages of the famous Loudoun Valley, Waterford is noted for its numerous and inexhaustible wells of the purest and best water, bracing air and low mortality rate. It has a little less than 400 inhabitants, many of whom are merchants and mechanics. The town is preserved through the Waterford Foundation. The Waterford Fair is one of the oldest crafts fair in Virginia. Four-time winner of the county’s “Best Event of the Year,” the historic village of Waterford welcomes the public from around the world each October for three days of living history, food, handicrafts, and live entertainment. It is a unique, fun filled experience of lively performances from traditional music and dance; reenactments by Colonial and Civil War-era militia and cavalry; art and photography exhibits, hands-on demonstrations of traditional American crafts by 155 renowned artisans (many nationally known) plus the ever-popular tour of private historic homes. It is a wonderful time for the whole family to enjoy the traditions of the past. To see any home for sale in Waterford, homes for sale in Loudoun County, Historic Homes for sale, Farms for Sale, or properties for sale, call me.